All of Trafalgar’s selected fire extinguishers are manufactured to the highest standards. They provide a comprehensive fire extinguisher service and use a fire extinguisher service by Europe’s leading manufacturers, ensuring the provision of suitable installation for location and use. Trafalgar also operates a complete site asset register for all sites which includes: location, equipment type and new / test dates. This register is available to all of our customers upon request. Water, Foam, CO2, Dry Powder Or Wet Chemical fire extinguishers can be supplied and maintained by fully qualified fire safety engineers. Our chosen fire extinguisher engineers are BAFE qualified and carry out fire extinguisher work for a range of organisations ranging from large organisations to SMEs. Whatever the type of environment our fire safety consultants and fire extinguisher engineers ensure that fire extinguishers match the environment’s requirements for type, numbers and positioning. A quick course in the types of fire extinguishers can be found here. Fire extinguishers help extinguish different classes of fire from A-F. Fire classification systems have been developed to aid the extinction process, detailing which extinguishing agents are the most appropriate for the various types of fire. The fire triangle theory tells us that, in order for a fire to ignite and develop, there must be three elements present: a heat source, oxygen and fuel. It is the fuel element that dictates fire type, as the fire classes are characterised by the burning material involved. 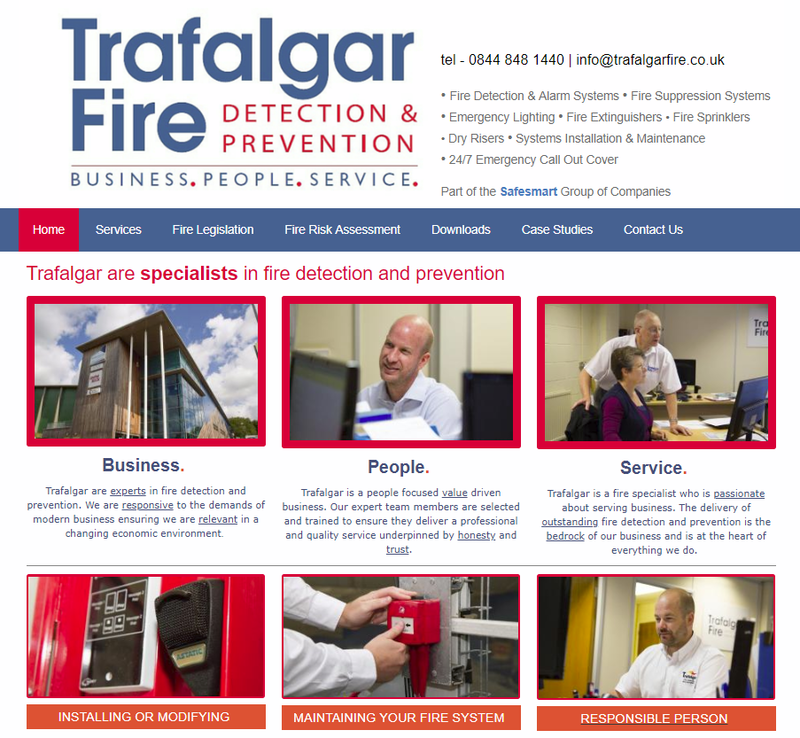 Trafalgar sub-contracts engineers who are BAFE SP101 registered for fire extinguisher service & maintenance. • Class A fires – involve organic solids such as paper and wood. • Class B fires – involve flammable or combustible liquids. • Class C fires – involve flammable gases. • Class D fires – involve combustible metals. • Class F fires – involve cooking fat and oil.